This original 19th century piece was acquired from the Star Island estate of Harvard graduate and real estate venture capitalist Thomas Kramer, responsible for re-developing South Beach by Sotheby’s in the nineties. Akiba Antiques then procured it from Sotheby’s after appreciating the artistry and time period from which the chair had come from. 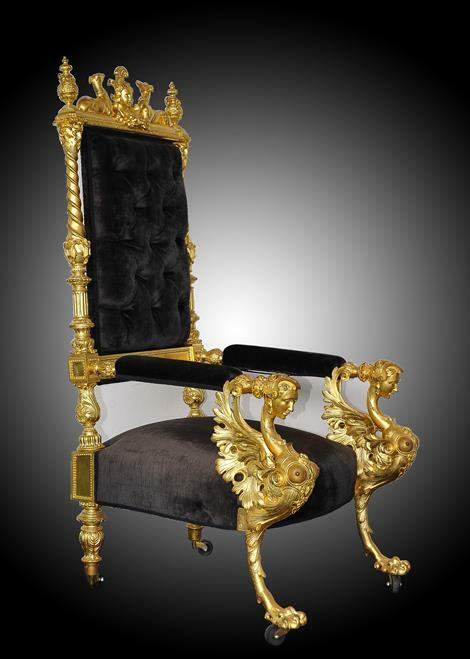 It allows for a regal sense to be felt in any room or collection with its ornate designs and black velvet cushions located on the arm rests and frame. This piece will be available the 27th of August 2014 in our upcoming auction allowing for its future owner to possess a piece that speaks for the era from which it came, the “Beautiful Era”.